We’d love your help. 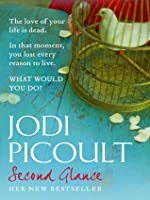 Let us know what’s wrong with this preview of Second Glance by Jodi Picoult. When odd, supernatural events plague the town of Comtosook, a ghost hunter is hired by the developer to help convince the residents that there's nothing spiritual about the property. An intricate tale of love, haunting memories, and renewal. (An interview about the book is included below the reading guide). An i When odd, supernatural events plague the town of Comtosook, a ghost hunter is hired by the developer to help convince the residents that there's nothing spiritual about the property. An intricate tale of love, haunting memories, and renewal. (An interview about the book is included below the reading guide). To ask other readers questions about Second Glance, please sign up. Vivian Yes, Meredith was in the same car accident as Ross. I had trouble getting into this, at first. I found the changing pov choppy. But about halfway through the book I found myself caught up in the story. As usual her work is frightening in how it describes the myriad positive and negative emotions involved in motherhood. Jodi Picoult is a fabulous story teller. She has a gift for sharing compelling stories, and for weaving intricate plot lines and interesting characters into a rich literary tapestry. In Second Glance Ms. Picoult has reached new highs. She introduces us to many different characters and story lines; she intertwines those characters to tell one fascinating fictional story; and she throws in a lesson about American history that is quite disturbing and educational. 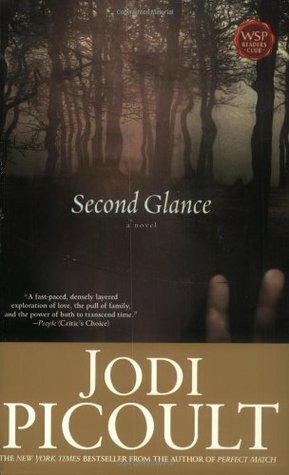 In Second Glance Picoult writes wit Jodi Picoult is a fabulous story teller. She has a gift for sharing compelling stories, and for weaving intricate plot lines and interesting characters into a rich literary tapestry. In Second Glance Ms. Picoult has reached new highs. She introduces us to many different characters and story lines; she intertwines those characters to tell one fascinating fictional story; and she throws in a lesson about American history that is quite disturbing and educational. In Second Glance Picoult writes with a magical descriptive quality that is reminiscent of Alice Hoffman, but undeniably Picoult in its detail, compassion, and intricacy. She talks of love and romance; reality and truth; guilt and responsibility; and science and the supernatural. Second Glance is, on one level, a ghost story. When a developer tries to build on a piece of land in Comtosook, Vermont, strange things begin to happen. The ground freezes in August; the sky rains down rose petals; and the home that is being demolished somehow rebuilds itself at night. Ross Wakeman, a retired “ghost-hunter”, haunted by the death of his own fianc�, agrees to study the construction site for proof of ghosts. His work not only forces the locals to consider the existence of ghosts, but leads to the re-opening of a 70 year old murder case. More than just a ghost story, Second Glance also teaches us about the horrors of the 1920s-1930s Vermont Eugenics project. In the 20s and 30s, some “learned” men in Vermont wanted to “preserve the state’s rural charm” by systematically eliminating “bad” genes from the reproductive gene pool. Violent tendencies, simple-mindedness, loose morals, etc, were believed to be the result of a poor genetic makeup, and Vermont’s population could be “cleansed” by eliminating these bad genes through forced sterilization. The local Abenaki Indians, having their own language and lifestyle, were victimized by the Eugenics laws, and often committed to mental hospitals and jails, and forced to undergo sterilization. Beyond these two stories, Picoult shares several love stories. Ross is consumed by his love for Aimee, his fianc�, and is over-ridden by guilt that he could not save her from death. He flirts with death as a way of re-connecting with Aimee, and feels trapped on earth until he is smitten by a new mystery lady. Shelby loves her brother Ross, is completely devoted to her son Ethan, but longs for romantic love. Meredith loves her daughter Lucy and her grandmother Ruby, but is too absorbed in her work to find time for romantic love. Cissy loves her husband and her unborn child, but has difficulty in loving herself. While I strongly recommend this novel, I find myself unable to summarize the plot. The story has twists and turns, rich detail, and interwoven story lines; and I fear that in attempting to summarize it, I would do a great disservice to the novel and to Jodi Picoult. Second Glance is at once a ghost story, a love story, and a murder mystery. It questions truth and reality, and opens the door to an acceptance of the supernatural. Second Glance also is a historical novel, sharing the sad truth of the Vermont Eugenics project and how that project effected the Abenaki. In the end, Second Glance is a compelling novel that should attract many readers and keep them up at night turning pages. Finalmente acabei de ler o livro. Não me importo nada que uma leitura seja demorada desde que a mesma me seja prazerosa. Não foi o caso deste livro, foi uma leitura muito lenta, difícil e deveras agridoce, houve alguns momentos que gostei mas no geral não me convenceu muito. Já é o terceiro livro que leio da autora, as suas obras nunca são leituras fáceis, mas esta foi a que menos gostei, não senti empatia com nenhum personagem e uma das coisas que mais me perturbou foi a facilidade e leviandade c Finalmente acabei de ler o livro. Já é o terceiro livro que leio da autora, as suas obras nunca são leituras fáceis, mas esta foi a que menos gostei, não senti empatia com nenhum personagem e uma das coisas que mais me perturbou foi a facilidade e leviandade com que a autora aborda o tema do suicídio, basicamente se não sabemos qual o propósito da nossa existência a solução é tirar a própria vida? Em vez de ir à procura desse sentido. Parte que achei interessante no livro porque o conhecimento e o saber nunca são demais, foi as informações sobre a eugenia e o quanto isso inspirou os nazistas e também saber um pouco mais sobre a cultura nativo americana. Not bad at all. I liked it and the characters. There were some very funny moments and not as much controversy as some of Picout's books which made this novel a lighter read than most of her books. I expected it to be a bit slow at the beginning and it did have some slow moments but not as much as I expected. I like the ghost aspect which I did not think I would from Picoult because I was afraid it would be like Danielle Steel's Past Present when the ghosts showed up but it wasn't. It was actuall Not bad at all. I liked it and the characters. There were some very funny moments and not as much controversy as some of Picout's books which made this novel a lighter read than most of her books. I expected it to be a bit slow at the beginning and it did have some slow moments but not as much as I expected. I like the ghost aspect which I did not think I would from Picoult because I was afraid it would be like Danielle Steel's Past Present when the ghosts showed up but it wasn't. It was actually well written. I don't believe in ghosts. Sorry, I just don't. You could put in a haunted house or whatever and at the end of the day I still wont believe in ghost. Even if I die and become a ghost and haunt all the people that did me wrong in my lifetime - I still wouldn't believe. Admitting all of that - I can't say that I was hesitant about reading this book nor did I have high expectations for it. I've said this countless time but I really do have a love/hate relationship with Jodi Picoult. Second Glance wa I don't believe in ghosts. Sorry, I just don't. You could put in a haunted house or whatever and at the end of the day I still wont believe in ghost. Even if I die and become a ghost and haunt all the people that did me wrong in my lifetime - I still wouldn't believe. Second Glance wasn't my favorite book of hers because nothing will ever beat my first love: Vanishing Acts. I didn't really connect with the characters or the story line while reading. I didn't really care about what was happening. I was entertained enough that I read the book start to finish without stopping. I feel like I just kind of wanted to get this book over with so I didn't let myself really stop reading or even think about another book. I guess if you believe in ghosts or into that sort of scene then I suggest you try out this book. I'm not really into because I don't believe in ghosts or anything but I've also read other paranormal books with ghosts or evil spirits that were a lot better than this book. First Jodi piccoult book. I set it down for 3 months, came back to it, found some things that started to click. Led me to read many many more Jodi piccoult books. I knew as I was sitting in a crowd of over 200 Jodi Picoult fans listening to her recount her field research for this book, it was going to be a novel that would have me looking over my shoulder taking a Second Glance for paranormal presence. This intricately layered novel does a perfect job of demonstrating Picoult's fantastical writing abilities. She is a master at her craft, and Second Glance has proven once again that Picoult can take on any subject matter, objectively present the facts for I knew as I was sitting in a crowd of over 200 Jodi Picoult fans listening to her recount her field research for this book, it was going to be a novel that would have me looking over my shoulder taking a Second Glance for paranormal presence. This intricately layered novel does a perfect job of demonstrating Picoult's fantastical writing abilities. She is a master at her craft, and Second Glance has proven once again that Picoult can take on any subject matter, objectively present the facts for both sides, and challenge the reader to question their belief system. Absolutely brilliant! To even begin to attempt to describe this novel, I have to say, I will not give it the justice it deserves. So, at its basic level, Second Glance takes the reader on a journey to show how love can travel through time and maybe... just maybe there are supernatural forces out there ensuring it travels safely. The story also blends the controversial subject of eugenics in the mix; and as a reader you can't help but wonder the possibilities of genetic diagnosis and replacement therapy with a proper blend of government and ethical organizational involvement. Picoult takes a myriad of subjects and ideas and wraps it around a paranormal theme; and despite the odd mix it blends just perfectly and challenges the reader to not discount the possibilities. Once again… absolutely brilliant. I really like Jodi Picoult, but the problem with reading many books by one author is that you start to recognize certain patterns and be able to predict the outcome of any given situation. I knew very early on what happened to Cecilia's baby, as I'm sure most readers did. I was also pretty sure I knew how Cecilia died because of a riddle I learned in elementary school. When the truth was revealed and I found I was right, I wasn't quite sure how to feel about it. I'm not trying to brag or anythin I really like Jodi Picoult, but the problem with reading many books by one author is that you start to recognize certain patterns and be able to predict the outcome of any given situation. I knew very early on what happened to Cecilia's baby, as I'm sure most readers did. I was also pretty sure I knew how Cecilia died because of a riddle I learned in elementary school. When the truth was revealed and I found I was right, I wasn't quite sure how to feel about it. I'm not trying to brag or anything. In fact, when I read something I like to try not to predict the ending. I like to be surprised. Unfortunately, Jodi Picoult seems incapable of surprising me anymore. If you're going to write a book from the perspective of a dozen different characters, then you better do it right. Unfortunately, Picoult doesn't do it right. Not even close. I only got as far as Chapter 3 or so and couldn't stomach the obviously dated speech and unconvincing behaviors of the characters. No self-respecting teenage boy would use the phrase "As if" or still use a Game Boy. And how can Ross just abandon his camera equipment most likely worth thousands of dollars and blithely refer t If you're going to write a book from the perspective of a dozen different characters, then you better do it right. Unfortunately, Picoult doesn't do it right. Not even close. I only got as far as Chapter 3 or so and couldn't stomach the obviously dated speech and unconvincing behaviors of the characters. No self-respecting teenage boy would use the phrase "As if" or still use a Game Boy. And how can Ross just abandon his camera equipment most likely worth thousands of dollars and blithely refer to them as replaceable. On the minimum wage he was getting? On what planet? The only storyline that had some potential was the doctor, Meredith, and her work with genetic engineering embryos. There was nothing about this book that felt believable, I just kept thinking "Who would do that? Who would say that?!" No one. Do you believe in ghosts? or in what we call paranormal activity? I used to watch a show called 'Ghost Hunters'. As the name suggests, in this show they hunt ghosts from attics and old mansions; they kind of showed us the presence of an energy in these places with the help of some devices. I was actually piqued by the idea. I always believed in the unknown energy around us; something like the existence of a sixth sense. But when I picked 'Second Glance' to read I never expected the story to be s Do you believe in ghosts? or in what we call paranormal activity? I used to watch a show called 'Ghost Hunters'. As the name suggests, in this show they hunt ghosts from attics and old mansions; they kind of showed us the presence of an energy in these places with the help of some devices. I was actually piqued by the idea. I always believed in the unknown energy around us; something like the existence of a sixth sense. But when I picked 'Second Glance' to read I never expected the story to be something like that. My first thought about Second Glance was that its just a book in which the existence of ghosts and invisible forces on earth are going to be questioned and in the end science is going to win. I was so sure! but was I wrong! This is my first Jodi Picoult book. I have 2 of her books in my 'to-read' list; 'My Sister's Keeper and 'Nineteen Minutes'. But apparently I decided to read Second Glance and this book was a wake up call!. Second Glance stirred my beliefs on undefined forces of nature. Don't think I m delusional but its the truth. This was an amazing read! Reading this story re-confirms why Jodi Picoult is one of my favorite authors. I believe it's one of her finest. Not only do I sincerely enjoy her prose and expressive style, but I also love the fact that every time I read a Jodi Picoult book I learn something new and interesting. In this case she weaves the issues of eugenics and genetics into an original story of a love lost. There are so many layers to this book, that’s what's so fascinating. The fact that there was a This was an amazing read! Reading this story re-confirms why Jodi Picoult is one of my favorite authors. There are so many layers to this book, that’s what's so fascinating. The fact that there was a multitude of unconnected characters introduced in the first part of the book didn’t confuse me at all, on the contrary, it intrigued me. It’s just thrilling when you find out how they are connected or related as the story unfolds. In that sense, it is a page turner. Also I found the ghost angle of the story totally believable. My favorite character was definitely the 103 year-old Abenaki, Az Thompson. I will highly recommend this book to all my friends. Again, another book for me where you have to suspend your belief now and again. But a good story if you are easily amused. The end was the hardest to swallow. Ross Wakeman has repeatedly puts his life at risk after the love of his life dies. When nothing works, and a job with a paranormal investigator brings him no closer to his former love, he moves in with his sister. As chance would have it, strange phenomena are plaguing the town, and Ross is drawn into an investigation of a piece of land th Again, another book for me where you have to suspend your belief now and again. But a good story if you are easily amused. The end was the hardest to swallow. Ross Wakeman became a ghost hunter after he lost his fiancee, Aimee, in a terrible car accident. He has never really believed in the paranormal, but he forces himself to take on the career so that one day he could be reunited with his lost love. He moves in with his motherly older sister Shelby, along with her son Ethan who is suffering from XP (xeroderma pigmentosum), in Comtosook, Vermont. There have been rumors floating around of supernatural activity in Comtosook. Several people believe it i Ross Wakeman became a ghost hunter after he lost his fiancee, Aimee, in a terrible car accident. He has never really believed in the paranormal, but he forces himself to take on the career so that one day he could be reunited with his lost love. He moves in with his motherly older sister Shelby, along with her son Ethan who is suffering from XP (xeroderma pigmentosum), in Comtosook, Vermont. There have been rumors floating around of supernatural activity in Comtosook. Several people believe it is due to a land dispute over a sacred Indial burial ground that is causing the strange occurrences. One day while Ross is investigating during the night he meets the mysterious Lia, who truly wakens him from his depressed mindset after Aimee's death. Her appearance causes Ross to discover startling revelations about Comtosook and its' ancestry. Jodi Picoult is a talented author. All the information in Second Glance is presented nicely and accurately, even if it must have required months to research each painstaking detail. I learned a lot about ghosts, and the most interesting nonfiction fact that I got from the book was the eugenics project going on in Vermont around 1930's. I thought only Hitler tried sterilizing humans he didn't see fit to live, but it turns out that people in the USA were doing the same thing. Go figure. Not my favorite Picoult novel, but there's some good stuff here. I wasn't familiar with the whole eugenics thing prior to reading this book. Appalling! Based on real events. "Men...were like an accessory, like a belt or purse or shoes. You didn't necessarily need one to complete your look. Granted, if you walked around barefoot you got a few odd stares every now and then, but the important parts of you were covered." Jodi Picoults really quality writing kept me interested throughout my reading of this novel. I was really impressed with her descriptions. Of course the novel having a bit of paranormal, a glimpse in earlier times, and a fascinating look in XP and all this functioning together made the story outstanding--at least in my eyes. I could figure out where the novel was going but the lush expressive writing made up for this. I guess my only critic would be that the names of the characters often had the Jodi Picoults really quality writing kept me interested throughout my reading of this novel. I was really impressed with her descriptions. Of course the novel having a bit of paranormal, a glimpse in earlier times, and a fascinating look in XP and all this functioning together made the story outstanding--at least in my eyes. I could figure out where the novel was going but the lush expressive writing made up for this. This is another fantastic novel from Jodi Picoult. I've read most of her novels and this is one of her best ones. The story was beautifully written and kept me enthralled and captivated the whole way through with its tale of ghosts, murder and family scandal. It wasn't what I was expecting and totally different from her usual books but I loved it. There were so many twists and turns in the novel that I was never sure what was going to happen next. Five stars. Strange things are happening in Comtosook, Vermont. It's August and temperature is fluctuating wildly, rose petals are falling like snow, and large chunks of land are freezing. We meet Ross, a young man devastated by the death of his fiancé, who has attempted suicide numerous times in hopes of reuniting with her. He takes a job with a company that investigates paranormal activities, hoping to be able to reconnect with her. The company is hired to investigate a controversial building site, which Strange things are happening in Comtosook, Vermont. It's August and temperature is fluctuating wildly, rose petals are falling like snow, and large chunks of land are freezing. We meet Ross, a young man devastated by the death of his fiancé, who has attempted suicide numerous times in hopes of reuniting with her. He takes a job with a company that investigates paranormal activities, hoping to be able to reconnect with her. The company is hired to investigate a controversial building site, which the local Abenaki Indians claim is an indian burial ground. The owner of the land, ironically, is an old, somewhat senile man who was involved in a 1930s eugenics project that nearly eradicated the Abenaki Indians. Ross moves in with his sister, Shelby whose son, Ethan, is allergic to the sun. The idea of living such an upside-life intrigued me -- sleeping during the day and staying up all night. But they were isolated because of it and I was glad when the investigation brought a law enforcement officer into her life. I had never read a book by Jodi Picoult and thought I should, since she's so hugely popular. She deals with complex subjects well and is a good storyteller. I liked this enough to possibly read another of JP's books. I think it could have been cut down by 100 pages. The writing was good, but at times excessively flowery. Also, I'll never understand how people can meet at the top of a page and be absolutely in love by the time you reach the bottom. Read quite some time ago but loved this book in fact love all of Jodi Picoult books. If you dig into my archive, you’ll find only two measly Jodi Picoult reviews, one of which is amongst my favourite books ever, Keeping Faith, (review for which is here) and Change of Heart, (which can be found here). In truth though, I’ve read over 7 of her books, which includes the likes of Nineteen Minutes, Salem Falls, The Pact, My Sister’s Keeper, Handle With Care, Perfect Match and The Tenth Circle. It’s no secret how much I love her books, her style, her content, though I know there are ma If you dig into my archive, you’ll find only two measly Jodi Picoult reviews, one of which is amongst my favourite books ever, Keeping Faith, (review for which is here) and Change of Heart, (which can be found here). In truth though, I’ve read over 7 of her books, which includes the likes of Nineteen Minutes, Salem Falls, The Pact, My Sister’s Keeper, Handle With Care, Perfect Match and The Tenth Circle. It’s no secret how much I love her books, her style, her content, though I know there are many who dislike her with an even stronger passion that rivals my adoration. Todays review, is on the book that competes with Keeping Faith in my eyes for the best Picoult book ever, and that’s saying a lot. Second Glance, was actually the first ever book of hers I brought on a whim, from a charity shop too many years ago. It would be years later that I actually picked up the battered and torn paperback, which had pages falling off it’s spine and I wondered why on earth did I even had in my possession a book that was less than perfect in physicality and even more than that, why had I PAID for it. This set me on the path to pick it up and read it, and my god, was I blown away. With all my reviews up to date, I’ve scoured my shelves to write a series of new reviews for books that I’ve loved but never gotten around to writing why that is. In the upcoming weeks, my blog will feature some classics like The Great Gatsby, to more up to date love/hate stories like The Host, and many more in between. Today though, is the day for Second Glance. This book, is a culmination of everything I love in a story, and yet it was something I never expected. I want to brand it a ghost story, but it’s so much more than that, it ties in love, loyalty, history, and when everything in your world collides with another world you thought was outside of your reach. I picked this up because the premise promised me a ghost story, and though I was sceptical at first (‘cause let’s face it, no one really writes a proper ghost story) I succumbed to the tale and couldn’t believe I had finally gotten a ghost story worthy of my time and love. [Are we losing count of how many times I’ve typed the word ghost? Update: 5 times]. Our story starts with Ross Wakeman, a man who lost the love of his life, and is desperately spending the rest of what he has left to follow her into the world he can’t be a part of. His desire to depart this world, ironically, is the one thing that seems to keep him firmly rooted in the current world, as he becomes almost immune to death. Get struck by lightening? Manages to stay alive. Stands on rooftops in heavy storms fixing electrical items? Never gets a shock. Even suicide eludes him - he feels trapped, with nothing to live for. One of my favourite aspects of the book, aside from the whole thing itself, (duh), was the inclusion of the eugenics history and the Abenaki tribe beliefs and traditions. Two sides of one coin, so perfectly balanced and well researched to be respectful but still bring that extra edge to the story. It was fascinating, and horrifying, reading about a programme like that which sadly did exist and Picoult plays up the repercussions of that part of our history and shows us the horrors it entailed. The best way to get into this book though, is to go in with your eyes closed - don't read any reviews, don't read too much into the premise, but just go in blind okay. The story will do the rest, it will take you left and right and up and down (you get the gist) it's a story you have to let happen to you , that's the only way you'll really feel the tale that's been spun here. So many wondrous twists, bound together so neatly. With a trademark opening like that, you really, really can’t go wrong. One of my favourite books and one of Picoult’s best, I’d highly recommend this book and if you do pick it up, I’m going to sit here, twiddling my thumbs, waiting for you to report back to me about how much you loved it. What a weird book! The plot was all over the place, with really strange coincidences. I can't even say I liked the main characters. Both Ross and Lia were suicidal so it was very difficult to empathize with them, specially because they kept hurting those they loved. Having only discovered the work of Jodi Picoult just over two years ago, this is already the eighth title that I have read. I think it is therefore safe to say that I enjoy her novels. This one is a ghost story and although I do not disbelieve in them I am somewhat sceptical. Seeing is believing so you never know, maybe one day. I think therefore that my scepticism was the reason that I was long way into the story nearly two hundred pages before I really began to appreciate properly what was going on. Once the storyline made sense I began to enjoy it much more, although I would not say it was amongst my favourites. Although the author herself said in August 2008, that Second Glance her tenth novel wrritten in 2003, to date was her personal favourite. Although the book is a work of fiction the work of the Vermont Eugenics Project actually exsisted as did the Sterilization Law of 1931. A disturbing practice to prevent problem citizens reproducing, similar to the plans of the Nazis for racial cleansing! Once again Jodi Picoult impresses me with her choice of a controversial subject to base a novel on. Ghosts, Abenaki Indians and Eugenics Research link the characters and the periods of 1932 and 2001 together in an excellent example of mixing fact and fiction and the past with the present. As much as Picoult is a storyteller...she is also very good at writing history. She was able to intertwine so many important subjects into this book- that I had to remind myself that I was really only reading one novel and not twelve short stories. AHHH...This book was so good with so many twists and turns. There are so many characters in this book that I had a difficult time keeping up--but eventually they all intertwine for a purpose. It was eerie, scandalish, poetic, exaggerated, and right on As much as Picoult is a storyteller...she is also very good at writing history. She was able to intertwine so many important subjects into this book- that I had to remind myself that I was really only reading one novel and not twelve short stories. It was eerie, scandalish, poetic, exaggerated, and right on the mark at the same time--- very very sad at times, also alarming because Picoult points out that History does indeed repeat itself no matter how much we want to believe that we learn from history. I especially love to read her acknowledgments and notes at the end of her writing- because she has a way of explaining or pulling together things that are happening in the real world to what happened in the book. Bravo Jodi- you got me again. I grabbed this novel because I am a Picoult fan, and while I heard mixed reviews from others, I found I thoroughly enjoyed the novel. There is twisting, winding plot- there is a ghost story, love stories of different kinds of love, an exposure of a dark secret in American History, and since it is a Picoult novel it touches on a sensitive topic- this time stem cell research. The dark secret has to do with something called Eugenics, developing perfect people and the sterilizing of those deemed le I grabbed this novel because I am a Picoult fan, and while I heard mixed reviews from others, I found I thoroughly enjoyed the novel. There is twisting, winding plot- there is a ghost story, love stories of different kinds of love, an exposure of a dark secret in American History, and since it is a Picoult novel it touches on a sensitive topic- this time stem cell research. The dark secret has to do with something called Eugenics, developing perfect people and the sterilizing of those deemed less than desirable candidates for procreation. This mainly occurred in Vermont, but I was disturbed to find out that this project started in 1910 at the Cold Spring Harbor lab which is two towns over from my current residence. Picoult listed all the research information/websites at the end of the novel, so while you are thinking I hope she made this up, it is sadly tree. I used to read a lot of mystery novels, specially those which are plot dependent, when I was a kid so maybe that caused me to treat any given dates and little details as CLUES on which the mystery can turn, to always try to guess what could possibly happen. And I tend to do the math instinctively of ages and dates. Its hard to stop that terrierlike reading mode. This book did not survive the terrier attack, way the plot turns just does not work with the dates and ages given. Maybe it was a bug i I used to read a lot of mystery novels, specially those which are plot dependent, when I was a kid so maybe that caused me to treat any given dates and little details as CLUES on which the mystery can turn, to always try to guess what could possibly happen. And I tend to do the math instinctively of ages and dates. It´s hard to stop that terrierlike reading mode. This book did not survive the terrier attack, way the plot turns just does not work with the dates and ages given. Maybe it was a bug in reworking an old abandoned draft, but my feeling was that is was more a symptom, that the author just did not think it that important, that the focus is to put as much possible emotional drama and tension into some hot topic she researched and wants to write about. I felt cheated, like being presented with some politician´s bombastic rhetoric while showing signs of being ignorant about important numbers or facts. Absolutely amazing. Bold and determined characters all throughout.